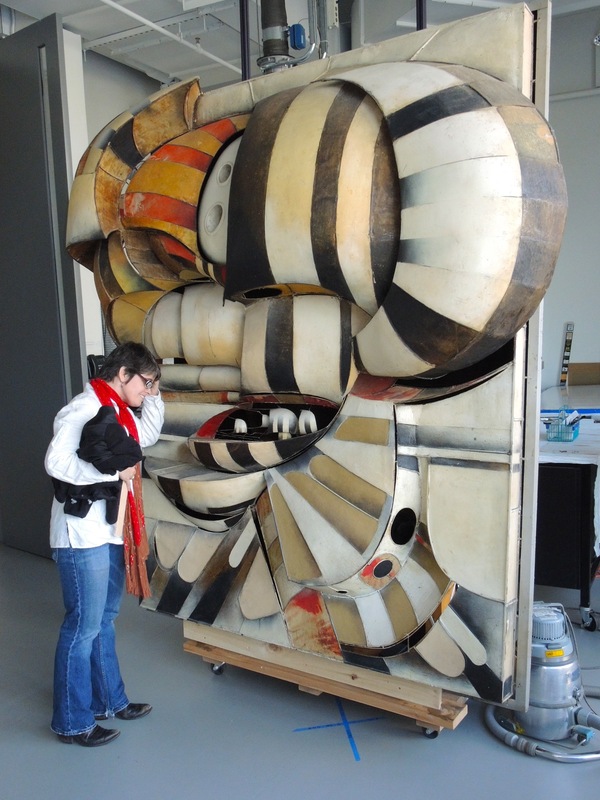 One of my roles as a museum director is to oversee the process of conservation of the Alice’s collection. This requires looking at priorities designated by a conservator who surveyed our objects years ago as well as heeding the recommendations of our collections committee in light of the inherent value of the objects to the museum. “Value” can be a very subjective term, so I’ll clarify that by saying we decide what to send for conservation based on what is valuable and necessary for telling the story of this museum, it’s founder, and it’s wonderful collection. 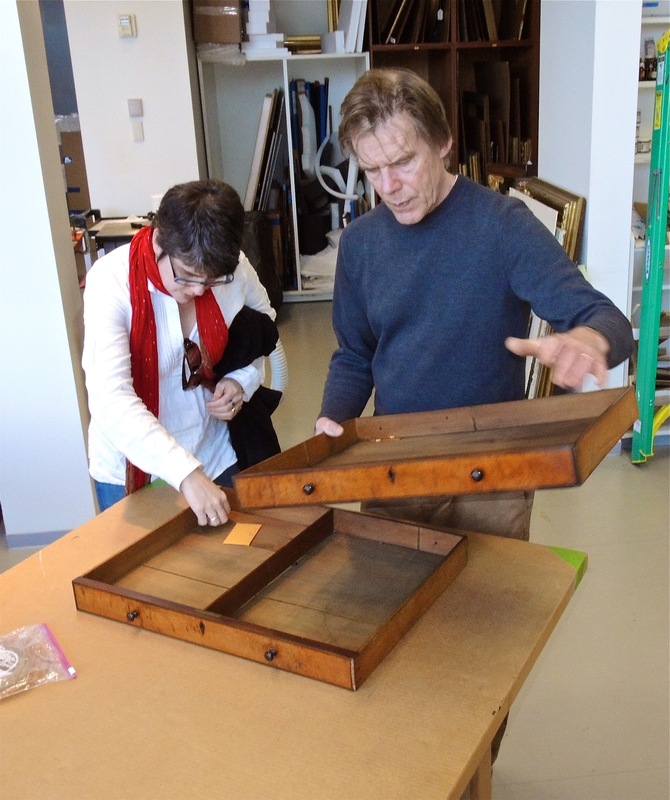 We recently delivered two tables from the collection to Williamstown Art Conservation Center in Williamstown, MA. Although it requires a very long day of driving, I really enjoy this aspect of my job. The drive is lovely and what awaits in Williamstown is always interesting and stimulating. Unless I am in a hurry to get back on the road home I always happily accept a tour of the conservation rooms. I find it really exciting to see the works of art being gently and painstakingly cared for by skilled and patient professionals. Included in the many pieces currently in process in the furniture conservation studio is the ornate music bench pictured above. The work that furniture conservator Hugh Glover is doing on the bench is very detailed. 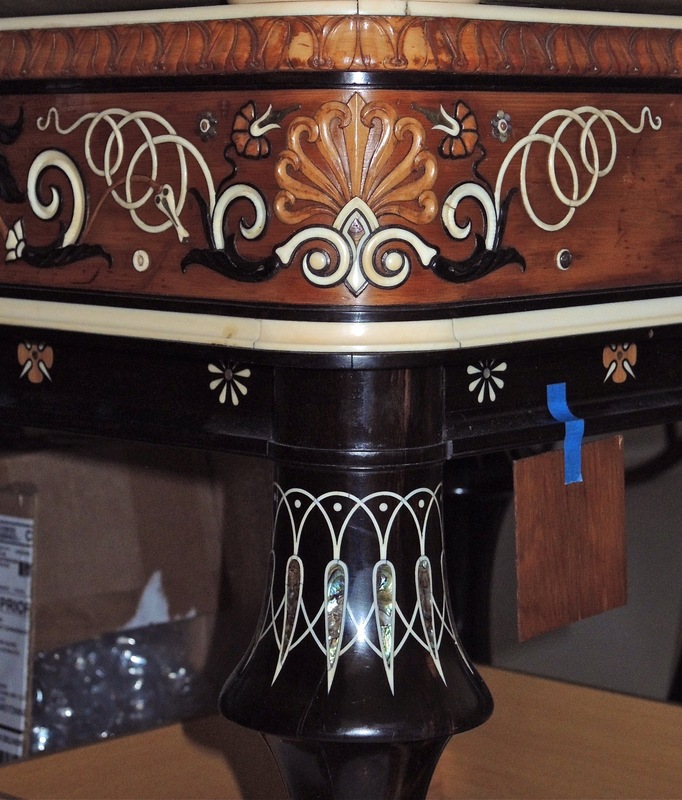 The inlay was damaged in several places and the ivory-monogrammed initials of the original owner had for some reason been crudely gouged out of the piece. Hugh was able to obtain a cast made from a companion piece but subsequently found it was slightly too large. He will need to work to make a new one the proper size and will then carefully affix it in the original place. At Williamstown it never fails that I will see pieces by artists familiar to me. 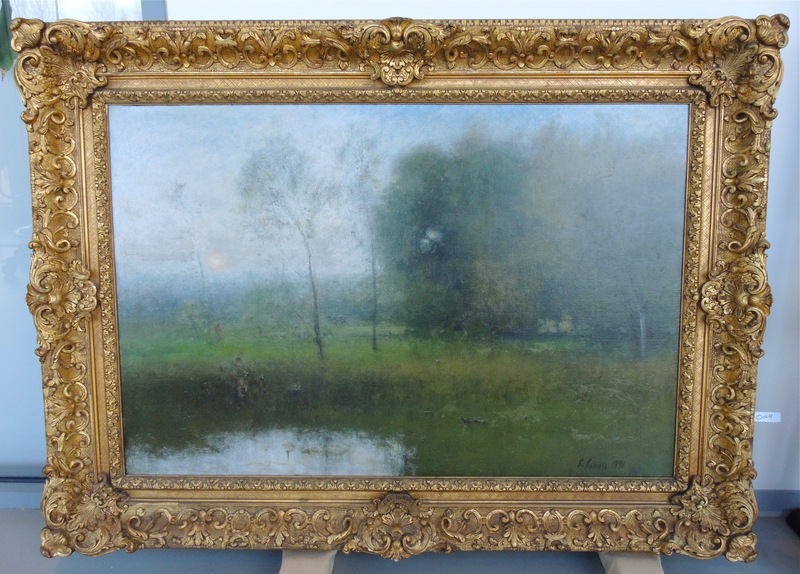 This time the paintings conservators had about half a dozen George Inness works in their studio. 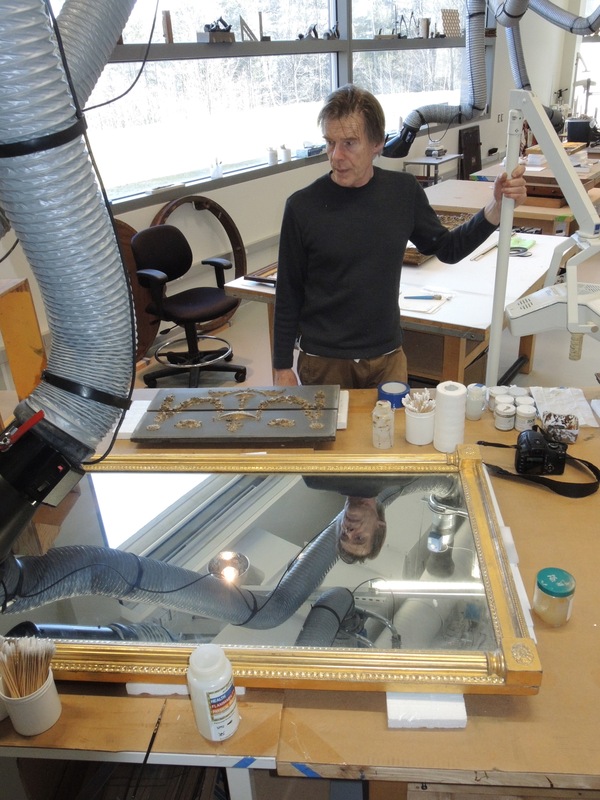 They are in the midst of conserving the pieces for the Clark museum, which is affiliated with the art conservation studios and is located on the same campus. Inness (1825-1894) was an American landscape painter whose influences included the Hudson River school. 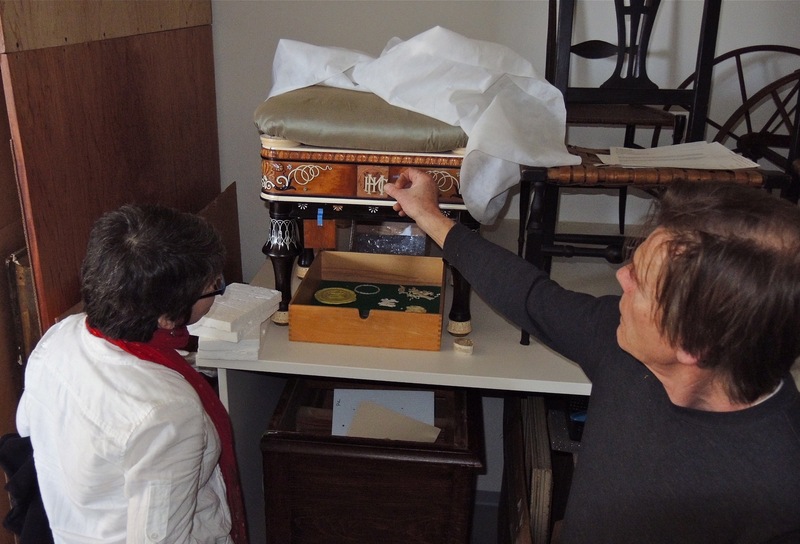 The two tables I left with Hugh for conservation will likely be at Williamstown for months as they undergo treatment. The museum will get a detailed report on the work completed as well as before and after photographs taken at the studios. Later this year I will drive back to see what new works are in progress and to usher our collection items back to their home in the North Country. Hopefully I will have time for another tour. 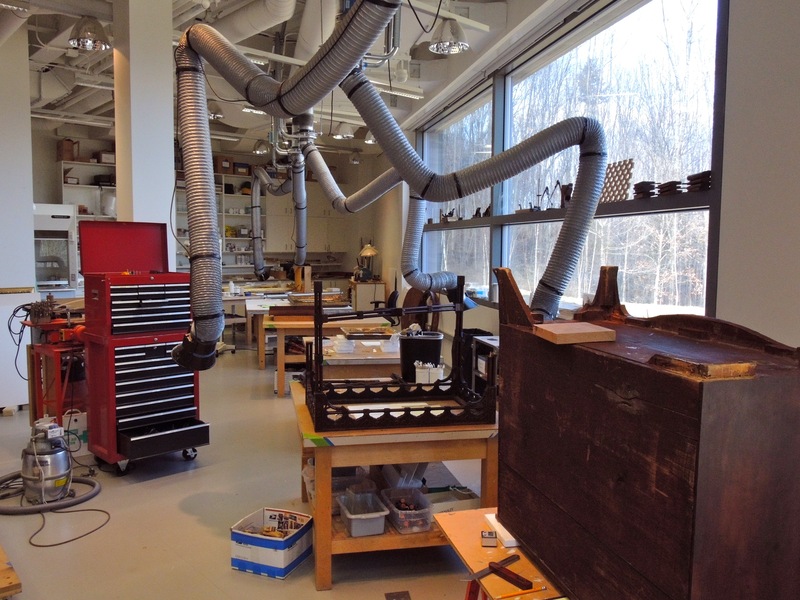 Aside from the variety of wonderful artwork, furniture and objects in progress at Williamstown, the studios are the envy of any serious artist or craftsperson. The recently erected facility has very well planned studios with state of the art lighting, ventilation, storage and workspace – so much wonderful space! As an artist I dream of having just a portion of one of these wonderful studios within which to do my printmaking, drawing, painting and dreaming!